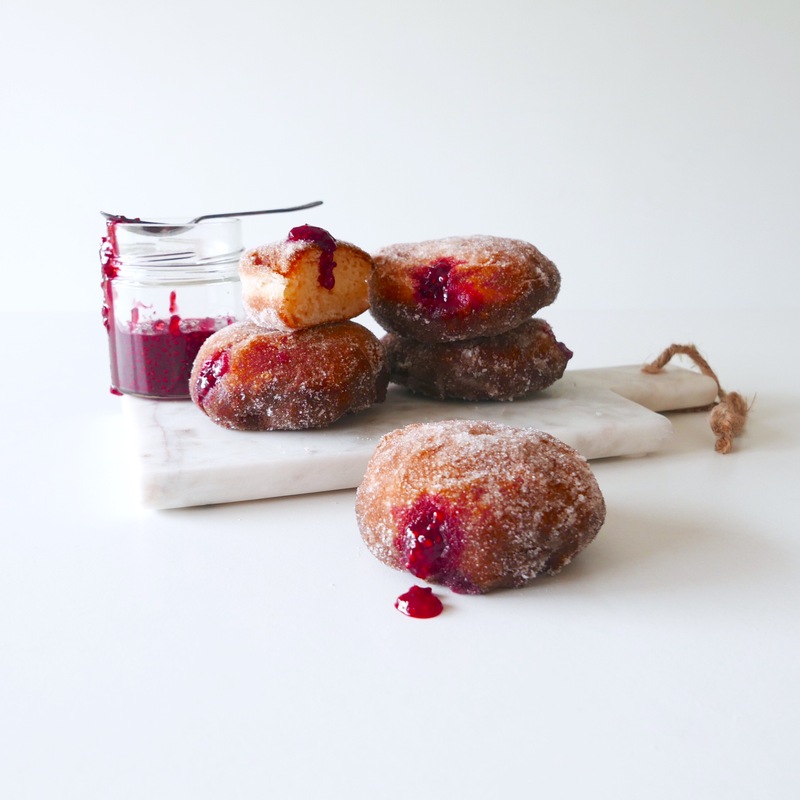 Jam Doughnuts. Need I say more? The first time I made these I thought to myself, “wow they aren’t that bad for you”, until I deep fried them and covered them in sugar. In my opinion though we all need to work on eating more balanced diets and this recipe has fruits and fats…you can’t get more balanced than that! For the jam: Place raspberries and sugar into a small saucepan over medium heat. Stir until the berries are melted and sugar is combined. Allow jam mixture to boil for 6-8 minutes and remove from heat. Let cool. For the doughnuts: Combine milk and a large pinch of sugar in a medium bowl. Sprinkle the yeast over the milk mixture and set aside for 5-6 minutes or until foamy. Stir in the remaining sugar and egg yolks into the milk mixture. Place flour and butter into a large bowl. Use your fingertips to rub the butter into the flour until it forms a breadcrumb like mixture. Add the milk mixture to the flour mixture and stir together until combined. Turn the dough out on to a lightly floured surface and knead for 5-6 minutes. Place in a lightly oiled bowl, turning to coat the other side. Cover with cling wrap and set aside for 1 hour. Knock back the dough with one hit and divide into 12 parts. Roll the 12 portions into balls and set on to a lightly greased baking tray. Be sure to leave enough room for them to rise and spread. Set aside for 50 minutes. Heat oil in a medium saucepan until 160ºC. Cook the doughnuts in batches of 3-4 for 8 minutes, turning once during cooking. Drain on paper towel. Using a large skewer, poke a hole from one end of the doughnut to the other. Place the jam into a small disposable piping bag fitted with a small round piping tip. 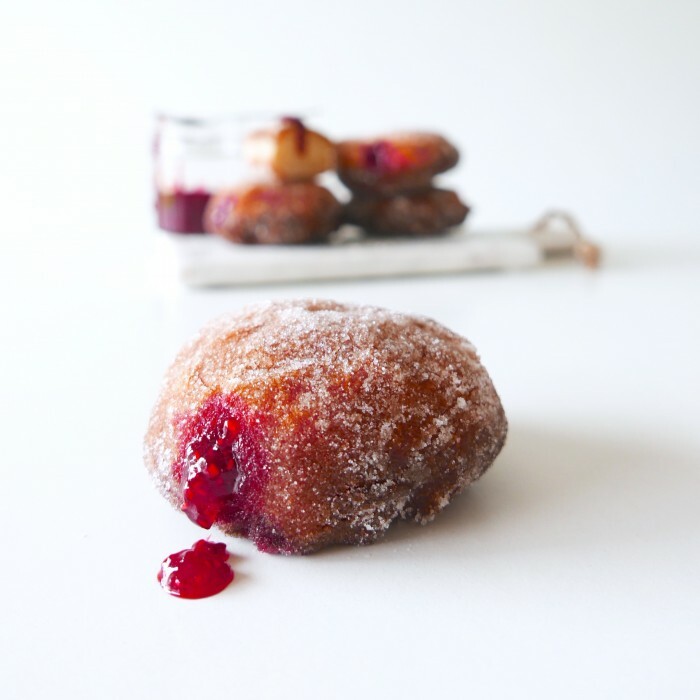 Push the piping tip into the hole made on either end of the doughnut and fill with jam. 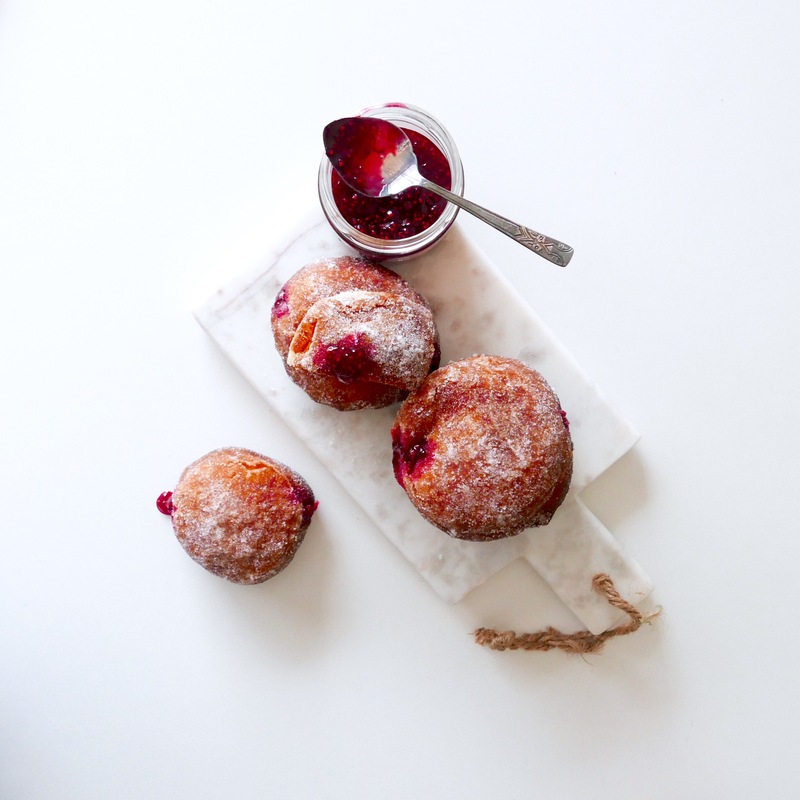 Roll doughnuts in castor sugar and eat while warm…YUM!